Banou Zolfaghari was born September 24, 1921 in Tehran, Iran. Surrounded by her devoted children and niece Bibigol, she passed away peacefully on February 21, 2017 in Santa Barbara California, her longtime home since emigrating from Iran in 1986. 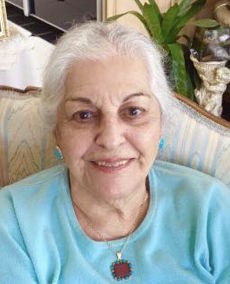 Banou loved spending time with family and friends and adored music and dancing. She was the life of any party. Her kindness, laughter, sparkling eyes, and joyful spirit charmed us all. She will be remembered affectionately as the heart of her large, loving family, including son, Kamran (Tricia), daughters Lila (Tom) and Ladan, granddaughters Roya and Yasmin, and her siblings, nieces, nephews, and in-laws. Her beloved husband, Allah Gholi Amirsoleymani, passed away in 2003. A celebration of Banou’s life will be held on March 11th from 3 to 6 pm at the Encino Royale clubhouse at 250 Moreton Bay Lane in Goleta. The family thanks everyone for their generous love and support.